NORTH EAST charity Calvert Trust Kielder has received a significant donation from regional care provider Helen McArdle to build self-catering holiday and short break accommodation at its Kielder site. The donation will pay for a new luxury chalet which will sleep four and boasts full disabled access alongside a modern, Scandinavian design with wood cladding and a green copper-effect roof to blend in with the site's natural surroundings. 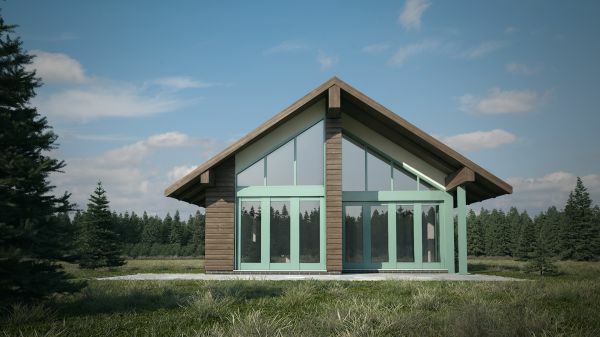 A double-height atrium with floor to ceiling glass windows and folding doors will give the lodge an 'inside outside' feel and also take full advantage of the stunning scenery on offer. Building contractors Walter Thompson are now on site and work is underway on 'The Helen McArdle' chalet which has been designed by the company’s in-house architects and will sit alongside the charity’s other luxury accommodation 'The Straker' and 'The Bradbury'. Family-owned Helen McArdle Care has been providing care for the elderly for more than 25 years. Chairman and founder Helen McArdle recently received a CBE for services to the care home business and the community in the North East of England. Speaking about Calvert Trust Kielder and the donation Helen said: "The work that Calvert Trust Kielder does has a hugely positive impact on many people across our region. "As a business with our roots very firmly in the North East we are keen to support the communities in which we operate as much as we can. Calvert Trust Kielder does a great job and is a truly fantastic place. It really is a life-changing experience for some visitors so we are pleased and very proud to be able to support the charity with a new luxury chalet. "We've been working hard with Calvert Trust Kielder to make this happen and now look forward to seeing the finished result." 'The Helen McArdle' chalet is expected to be open for bookings later this year and will be part of Calvert Trust Kielder's growing accommodation offer which also includes the award-winning tree-house the 'Sky Den' and self-catering chalets. Calvert Trust Kielder CEO Peter Cockerill is understandably very grateful for the donation. "We value the support of our local community and businesses very, very much - they help us carry out our good work and enable us to continue offering the fantastic services we do. "This donation from Helen McArdle doesn't just provide us with another really great place to stay at Calvert Trust Kielder. It provides an ongoing, vital revenue stream for the charity and means we will continue our work with disabled adults and children long into the future. "It is quite literally an amazing and very generous thing to do. We are very, very grateful to Helen and everyone involved". For further information visit www.calvert-trust.org.uk/kielder.